Dr. Sullivan Shares News of Recent Publication in Plastic and Reconstructive Surgery Journal - Patrick Sullivan, M.D. Dr. Sullivan and his team are very happy to share that Dr. Sullivan has again been invited to contribute to the prestigious Plastic and Reconstructive Surgery Journal. 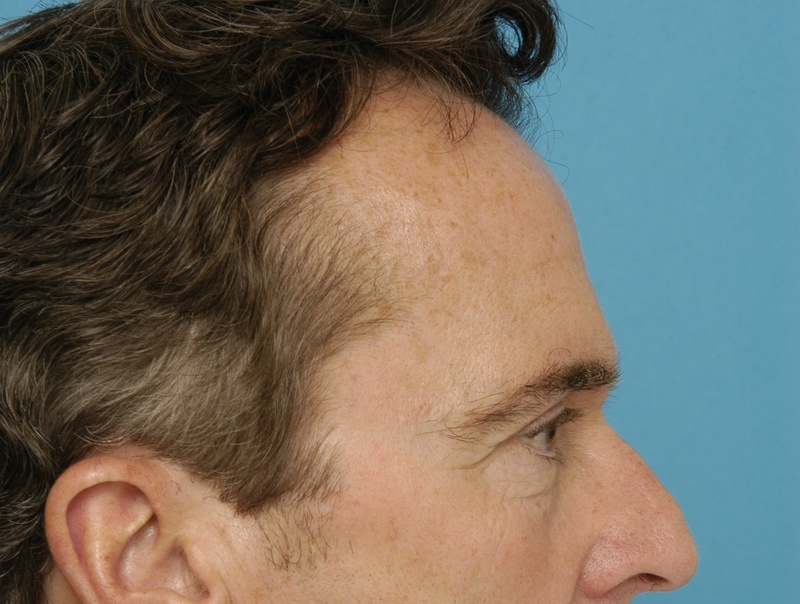 In this most recent December article entitled, “Finesse in Forehead and Brow Rejuvenation: Modern Concepts, Including Endoscopic Methods”, Dr. Sullivan and his co-authors discuss Dr. Sullivan’s minimally invasive approach to brow rejuvenation. The article traces the evolution of brow rejuvenation, from its earliest inception over a century ago to advanced techniques which now allow our patients to return to work often a week after surgery and with minimal to no visible scarring. As we age many people notice that the outer part of their eyebrows has fallen or that the frown lines in their foreheads can lead to an upset or overly stern appearance. Often this appearance may lead to miscommunications or misunderstandings. Patients tell Dr. Sullivan that they are being told they: “look tired” or “look upset or sad” when they are not. Dr. Sullivan’s approach to brow and forehead rejuvenation aims to help address these concerns and smooth out the signs of age and stress. 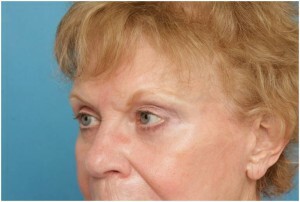 In this most recent PRS article, Dr. Sullivan delineates findings from over 500 of his brow rejuvenation surgeries and discusses how his endoscopic, minimally invasive approach leads to excellent, long-lasting aesthetic results that help to address not only the brow and crow’s feet but also can address areas of deflation and bunching around the temporal region. Accompanying Dr. Sullivan’s article in Plastic and Reconstructive Surgery Journal is a separate independent analysis of Dr. Sullivan’s methodology as evaluated by David Hidalgo, MD. Dr. Hidalgo is an expert in plastic surgery in New York who has published extensively. 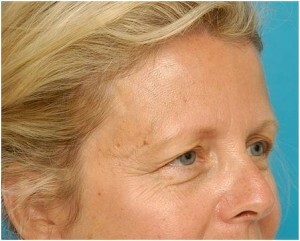 In this discussion piece, Dr. Hidalgo thoroughly examines Dr. Sullivan’s approach to brow rejuvenation and finds, “Dr. Sullivan and associates present a highly evolved and time-tested approach to endoscopic brow-lift technique.” Further, he goes on to state that Dr. Sullivan’s approach “serves as a bellwether for experienced surgeons to compare and contrast their own evolution in brown and forehead rejuvenation concepts”. The journal, Plastic and Reconstructive Surgery is the official journal of the American Society of Plastic Surgeons and has been the pre-eminent reference source for every surgeon who works in the field of and/or uses plastic surgery techniques. Further, it is the premier source of peer-reviewed digital and print articles dedicated to, “chronicling the present and laying the experimental and clinical foundations for future advances in clinical plastic and reconstructive surgery”. The journal emphasizes and supports only the highest quality patient care and maintains strict professional and ethical standards when accepting submissions to their journal. Recently, Dr. Sullivan was honored to receive the Best Cosmetic Paper for publication year 2013 from this prestigious journal. If you would like more information about Dr. Sullivan, his team and their work, or if you would like to know more about a specific procedure, please contact us today. We will be happy to answer your questions, or help you to schedule a consultation with Dr. Sullivan. 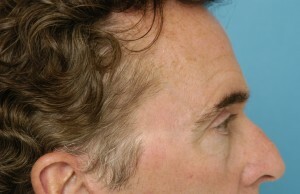 The above gentleman had an endoscopic brow lift where the incision site followed the irregular path of the hairline in order to best disguise any scaring. 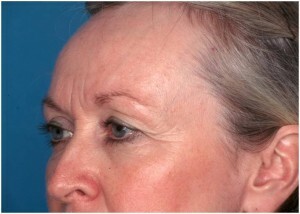 The patient also underwent a face and neck lift as well as brow and temporal lift. As the photos above demonstrate, the brow and temporal lift helped to address the hooding of the upper eyelid and also prevented skin bunching around the temporal region from the tissue that was lifted from his mid and lower face. A woman came to me concerned about her unusually high forehead. 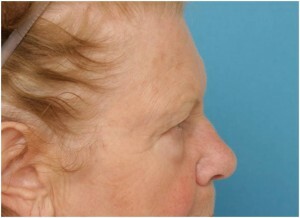 She was treated by lowering the forehead using a hairline incision. We also addressed her upper eyelid hooding and temporal region through performing endoscopic forehead rejuvenation lifting only the outer most portion of the brow and temporal area. 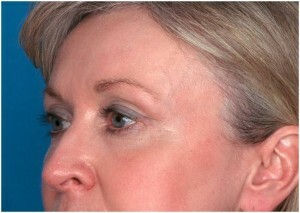 Through using this technique all scars are hidden in the upper eyelid crease, rather than extending out into a more visible area of upper lid. 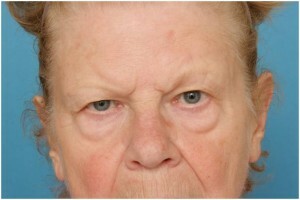 The above 69 year old business woman expressed concerns over the eyebrow laxity and hooding of her upper eyelid. 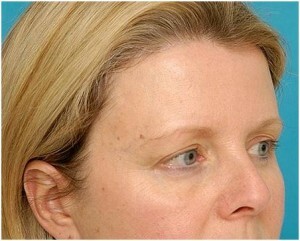 Due to her concern that her brows would appear surgically altered, we used an especially conservative approach. 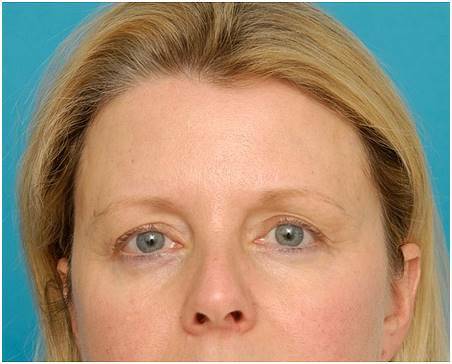 Using an endoscopic brow and temporal lift we were able to move her brows into a more natural position. 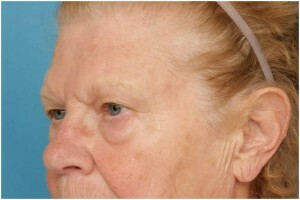 An upper and lower eyelid blepharoplasty was also performed at the same time as this procedure with the scars hidden. The above 51 year-old woman expressed concerns over heavy forehead soft tissue and brow laxity as well as concerns over the appearance of her upper and lower eyelids. 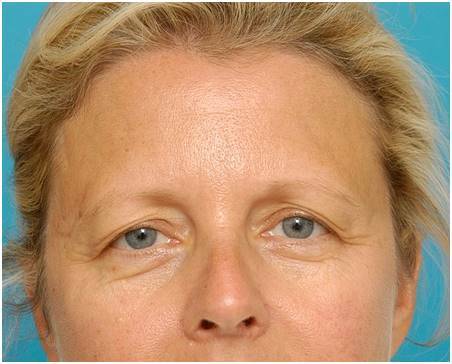 She was treated through a brow lift, using hairline incision, as well as upper eyelid blepharoplasty. 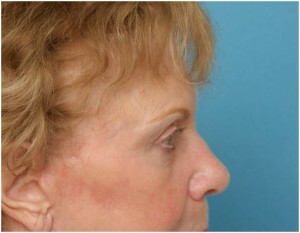 The technique used to treat her upper eyelids did not result in visible upper lid incisions. 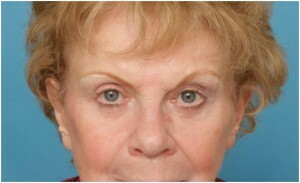 The lower eyelids were treated with surgery as well as botulinum toxin. We did not attempt to overcorrect the brow position, as our emphasis is always on achieving a natural result rather than an overdone, surgically altered appearance.